Confirmprize.com is the PUP that uses misleading techniques to prevent removal. Use Reimage to locate malicious components and get rid of them faster than with uninstall instructions. A full system scan blocks virus reappearance and prevents traffic to malicious domains. Confirmprize.com is a potentially unwanted program that injects various ads to your most visited sites and redirects you to related sites. Confirmprize.com is a potentially unwanted program that affects the performance of your browser in a negative way as it fills it with tons of misleading ads. Before that, it needs to trick its victims into allowing push notifications. If traffic on your Mozilla Firefox, Google Chrome or another browser has been redirected to this questionable site, you have already been tricked into allowing these notifications. In this case, you need to block them and then check your device for the adware-type program. 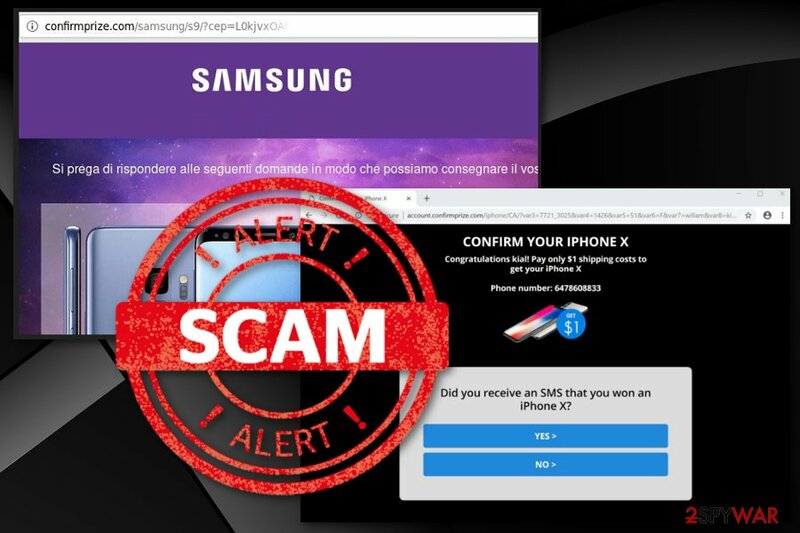 Intrusive advertisements, constant redirects to questionable websites and commercial pages, sluggish browser's performance are the most common symptoms of Confirmprize virus. Like hundreds of other potentially unwanted programs, they can also be used for collecting users' non-personally identifiable information. While it does not include passwords and other sensitive details, sharing it with bad people can lead you into trouble. Confirmprize.com virus is often called like that because of the intrusive and questionable content it delivers on users' screen. However, this program is not malicious as ransomware or similar viruses seeking financial or other benefits from their victims by leading them to data loss and other serious issues. The main issue caused by this PUP is the intrusive content which redirects users to commercial sites and dimish their time online in this way. The main purpose of PUPs like this adware is to create profit for its developer. This is achieved by tricking users into clicking on various banners, coupons, pop-up windows and similar content delivered to their browsers while browsing the Internet. Each click is monetized and generates revenue, but there is always a danger to be redirected to questionable websites. you are suffering from constant browser crashes. You must remove Confirmprize.com as soon as possible because potentially unwanted programs and other silent intruders can be set to collect information about the user at any time. This data tracking is initiated by the advertiser because various personal non-identifiable information helps create more personal commercial content. Typically, such PUPs can collect IP addresses, location, browser history, search queries, most viewed websites, and similar information which is later shared with third-party advertisers. Another distinct feature of Confirmprize.com adware is deceptive content on pop-up ads, commercial websites. You may encounter various messages stating that you can win an iPhone or another valuable prize. It is possible that these pages suggest to fill out surveys, enter your personal information or answer questionnaires. Be aware that this is a scam and your contribution may lead to dangerous consequences or loss of sensitive information. Confirmprize.com removal is not so difficult if you know what tools to use. You need to get a reputable antivirus program if you have none and scan your device fully. This full system scan can help you detect all suspicious threats and viruses hiding in the system. Researchers also advise using computer repair tools like Reimage for cleaning the system after virus termination. Confirmprize.com is a Push notifications virus that bombards the browser right after you allow its ads. Marketing technique when products are packed with other products is known for a while and widely used by PUP developers and freeware providers. Unfortunately, these people bundle additional programs with software people tend to get via p2p network services or torrent sites or deliver their products via deceptive advertisements. If you skip through steps during freeware installation and chose Default or Quick options you are risking to get more than you want. Opting for Advanced or Custom installations allows you to see additional applications and de-select unwanted ones. This is an easy step which you need to take more often during processes like this. Better safe than sorry so choosing reputable and trustworthy sources also is beneficial. Update your software more often so you are not tricked to download suspicious programs when a deceptive advertisement appears on the screen. Confirmprize.com removal is a process that you need to follow quickly after noticing any adware symptoms. The best solution for cyber infections like this is running a full system scan with the antivirus tool. We have a few suggestions for similar software down below, so you need to choose what suits you the best. Here, look for Confirmprize.com or any other recently installed suspicious programs. Wait until you see Applications folder and look for Confirmprize.com or any other suspicious programs on it. Now right click on every of such entries and select Move to Trash. When in the new window, check Delete personal settings and select Reset again to complete Confirmprize.com removal. Once these steps are finished, Confirmprize.com should be removed from your Microsoft Edge browser. Here, select Confirmprize.com and other questionable plugins. Click Remove to delete these entries. Now you will see Reset Firefox to its default state message with Reset Firefox button. Click this button for several times and complete Confirmprize.com removal. Here, select Confirmprize.com and other malicious plugins and select trash icon to delete these entries. Click Reset to confirm this action and complete Confirmprize.com removal. Here, select Extensions and look for Confirmprize.com or other suspicious entries. Click on the Uninstall button to get rid each of them. Now you will see a detailed dialog window filled with reset options. All of those options are usually checked, but you can specify which of them you want to reset. Click the Reset button to complete Confirmprize.com removal process. ^ Steve Morgan. Ransomware damage costs predicted to hit $11.5B by 2019. CSO. Offers the latest information and best practices on business continuity and data protection. ^ Andy Smith. Data collection dangers. BritishComputerSociety. The Chartered Institute for IT, promotes wider social and economic progress through the advancement of information technology science and practice. This entry was posted on 2018-09-25 at 07:38 and is filed under Adware, Viruses. You can quickly scan the QR code with your mobile device and have Confirmprize.com manual removal instructions right in your pocket. How did you remove Confirmprize.com?